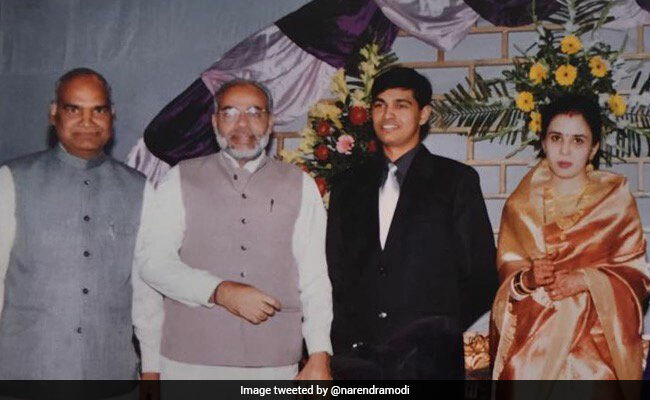 Prime Minister Narendra Modi tweeted an old photograph with Ram Nath Kovind. Minutes after the results of the Presidential elections were declared today, Prime Minister Narendra Modi tweeted two group photographs that showed President-elect Ram Nath Kovind and himself. In one, both look much younger. The accompanying text reads: "20 years ago and the present... always been a privilege to know you, President Elect". The President-elect too, admitted that it was an "emotional moment" for him. "I never thought I will become president, it was never my goal," Mr Kovind said in his address. "It has been raining since the morning. Rains remind me of my village, of our kuchcha home with walls of mud and a roof that could not repel water during the monsoon..."
From that village - Paraukh in Uttar Pradesh -- Mr Kovind went on to become a lawyer who appeared at the High Court and the Supreme Court. He also joined politics, becoming the leader of the BJP's Dalit wing and a member of the Rajya Sabha for 12 years. The 72-year-old became PM Modi's choice for Bihar Governor two years ago - a decision that had initially irked Chief Minister Nitish Kumar, who complained about not being consulted. Last month, Mr Kovind was named the BJP's choice for President at a meeting led by the Prime Minister and BJP chief Amit Shah. As Mr Shah made the surprise announcement, PM Modi personally talked to Congress leaders Sonia Gandhi and Dr Manmohan Singh and the Chief Ministers of Bihar, Odisha and Andhra Pradesh to seek their support for Mr Kovind. Saying he would make an "exceptional president," he further tweeted: "Shri Ram Nath Kovind, a farmer's son, comes from a humble background. He devoted his life to public service & worked for poor & marginalised". Today, in a series of tweets, the Prime Minister thanked the electoral college for their "extensive support for Shri Ram Nath Kovind Ji". Thanking opposition candidate Meira Kumar, he said, "I also congratulate @meira_kumar Ji for her campaign, which was in spirit of the democratic ethos & values we all are proud of."